Before you can work on the finer points of your set-up and stroke, it’s vital that you have the ability to ‘see’ and relate to a perfectly straight line to the hole. So one of the very first things that I do with a new pupil is challenge his or her perception of a straight putt. And you’d be surprised at the results, even among tour players. With the straight line of balls in place, the challenge is to address the cue ball and take ‘dead aim’ at the nearest ball (i.e. brown), just as if I were aiming to strike it face on. I focus on squaring the putter-face to the brown ball and, when satisfied with my set-up, I look up to focus on the next ball, the blue. What do I see? Does the line of balls still appear straight? Well, not really… and I feel the need to adjust my putter alignment to the blue ball. 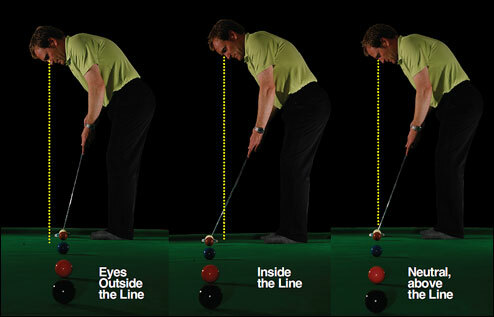 Moving my focus further down the table, to the pink and black balls, do I feel I should realign my putter? Well yes… but I know all the balls are aligned correctly? What sense does it make to feel the need to align the clubface differently for straight putts of 2 feet (to the brown ball), 5ft (blue), 7ft (pink) and 9ft (black) all down the same line? What is happening? The answer is that, according to their position relative to the line we are looking down, our eyes provide differing information to the brain as we turn our heads and focus further away. The length of the snooker table, with the use of the brown, blue, pink and black spots, enables me to place the balls in a perfectly straight line. All you snooker players out there know that it’s pretty easy to see a straight line when you are in position, eyes low to the table. But what happens when you stand up to a putting posture, taking your position to the side of the ball? And what happens when you then swivel your head to scan the line to the hole? Do the balls still appear in a straight line?! GO OUT AND TEST yourself. Create a dead straight line of balls into a hole, and then, once in posture, just sway gently back and forth over the ball you are addressing and focus on each of the balls in turn as you swivel your head to check alignment. The line will appear to curve, either gently left-to-right or right-to-left, and, according to where your focus lies, that is where you will aim your putt. It’s no exaggeration to say that 9 times out of 10 I get the same reaction with all golfers I teach – and I’m including tour players. Clearly, the perception of the line is at odds with reality, and if that’s your experience on the greens you either (1) address the anomaly or (2) continue to aim putts inaccurately. Which would you prefer? Good answer... you’d like to address the problem, and so your goal is to try to ensure you align the putterface square to the target line, irrespective of distance. The first step with the vast majority of players I coach is to use my Quintic Putting Mirror to assess the position of a player’s eye line in order to match perception with reality – i.e. to identify where they see a straight line at set-up. As demonstrated on the snooker table, some see a straight putt with their eyes parallel to the target line (right above), the majority adopt a position with the eyes just inside the target line (middle) and in a few cases a player sees a straight putt with their eyes outside the line (left). On the snooker table, there is only one position where the putter-face is square to all four of the coloured balls, not four positions. 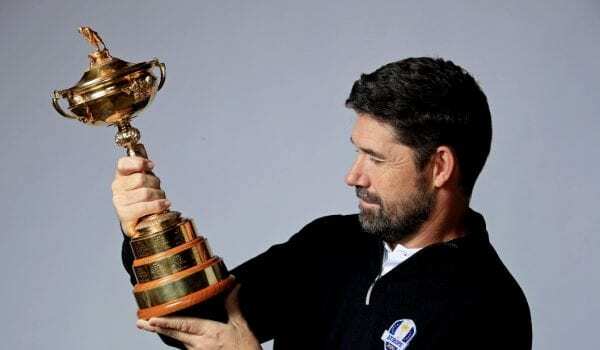 I’m well aware that putter-face direction accounts for over 90% of the ball’s starting line, so I need to find the position over the ball where my eyes and brain are in unison to achieve this. To correct this most fundamental of alignment issues, you have to accept that you will need to adjust your posture and eye line over the object ball at address – hopefully, only slightly, until you see that line of balls as running true. Here’s the bit you have rarely thought about: once you have adjusted your eye position (and with it your posture) you then must have both the length and lie of your putter checked and, most likely, tweaked to ‘fit’ this correct set-up position. This is one of the most critical elements in the whole process of becoming a better putter; look at the angle of the shaft (above) to see what I mean about length and lie! For example, if your eyes are inside the line, your putter will need to be longer and flatter, your eyes outside, your putter will be shorter and more upright. Speak to your local PGA Professional for advice and invest in this improvement! You can easily use a putting mirror by yourself to achieve the optimum eye position over the ball and, contrary to popular opinion, that is not necessarily directly above it. Once you have found your position, mark the mirror with a Sharpie so that every time you use the mirror in practise you are working from the same correct position. Hit putts. Do your eyes remain in the same position after the ball has been struck? The simple fact here is that it is all about YOU as an individual. So do the research: find out where YOU see the straight line, where YOUR eyes need to be to see that straight line. Once you have that information, you can begin to practice with real purpose, and ingrain consistent alignment factors into your routine. 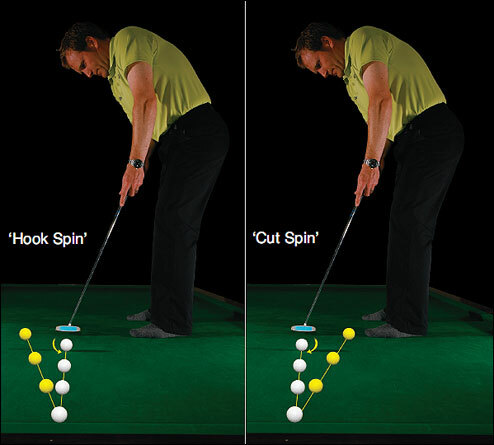 I am often asked ‘does side spin have an effect on the path of the ball during putting?’ The short answer is ‘yes’. A longer answer has been arrived at courtesy of the The Quintic Ball Roll System I have developed to analyse spin and roll accurately during putting. I often see measurements of over 30rpm of sidespin on a putt. Is this enough to make an 8 foot putt miss the hole? Potentially yes. Again, the snooker table can help me to explain. Spin doctor: striking the cue ball either side of the vertical axis line (illustrated with a dashed line in the left hand graphic) enables a skilful snooker player to curve the path of the ball, such as would be necessary to strike the red in this example. In planning the outcome of the shot, consideration would also be given to the reaction of the cue ball following contact with the object ball (as illustrated below), all of which goes to explain the difficulty of the game and the skill necessary to navigate the table. And, just as it is possible to create sidespin with a snooker ball, so a golf ball is susceptible if struck off centre with a putter, just as in the full game – with consequences! The game of snooker requires a lot of skill and precision, players use many techniques to be successful. In principle, the simplest shot in snooker would be where the white cue ball, the object ball (the coloured ball aimed at) and the pocket are lined up perfectly in a straight line, with nothing obstructing the path of the balls. We can all pot this shot (well, everyone except Jonathan Yarwood, who’s rubbish at snooker!) as long as the cue ball is struck with the correct force (i.e. not so little that the object ball would not reach the pocket, but not too much that the cue ball would follow the object ball into the pocket). This shot requires the player to hit the cue ball directly in the centre and follow through along the aiming line... simple! However, in game situations, most shots are not this easy and require other techniques to adapt to the situation. One example is where another coloured ball is blocking the direct path of the cue ball (as per the diagram above). In this situation, the player can employ a technique which creates side spin. Side spin is achieved by striking the cue ball on either side of the vertical plane (i.e. either left or right of the centre line displayed by the dashed line in the graphic). When the cue ball is struck directly on the centre line, it will move in a straight line determined by the point of aim of the cue ball. However, if struck left or right of this centre line, the ball will respond by moving off line right or left respectively, and the proportion by which the ball is deflected off a straight line path is determined by the force and direction the cue strikes the ball. This deviation from a straight line to a curved path can be explained by the axes of rotation. The spin is not as simple as the ball just rotating clockwise or anticlockwise if viewed from above. Due to friction between the ball and the baize, the cue ball also rolls (just like a golf ball). As the ball rolls, the orientation of this side spin axis changes in relation to the initial position causing sideways motion due to the reaction forces caused by the friction between the table and the moving ball (Newton’s Third Law). When considering the example above, where the direct line from the cue ball to the object ball is partially obstructed, we must consider what happens later on in the shot, not just the deviation immediately after cue impact. Just as the cue ball moved off the straight line path when first struck, in time the cue ball will come back towards this straight line path, and will even continue to veer off the direct line in the opposite direction if given enough distance. The degree of side spin imparted on a snooker ball can be as much as 500 rpm, if the cue impact moves further away laterally from the centre line. However, as the amount of side spin increases, consequently so too does the degree of deflection away from the direct line. It is important to remember that just as you don’t want to hit the ball down the centre line, similarly it is important not to hit the cue ball too near the edge, as this will result in a ‘miscue’ whereby the cue tip slides around the side of the ball, and the cue ball deflects off its intended line (pass the chalk!). Bearing all this in mind, it is becoming clearer why side spin is so complicated and hard to master. And while unwanted side spin in snooker could be regarded as a ‘nuisance’, adding an extra variable to consider during a shot, the ability to manipulate spin is a skill that separates better players, allowing them to control and position the cue ball around the table at will. Another scenario whereby the effect of side spin on a cue ball is important is when it comes to considering the rebound off the cushion. When a cue ball is hit with side spin down the length of the table, there is no difference in speed compared to if the ball was struck down it’s centre line, as it is assumed the ball only makes ‘point’ contact with the table. However, side spin is known to affect both the rebound speed and the rebound angle of the cue ball (Mathavan, S. et al., 2009) changing the way the ball bounces off the cushion. The essential at the highest level, and clearly adds to the difficulty of a shot. If a cue ball strikes a cushion at 90 degrees without any form of side spin, it will rebound directly along its line of approach. Additionally, with no side spin, if the ball strikes the cushion at a 30 degree angle, it will rebound at 30 degrees and so on (see graphic above left). However, this changes with side spin, as can be seen below. This use of sidespin changes the direction of the cue ball later on in the shot. After it hits the object ball and deflects onto the cushion, the sidespin is still in effect and the object ball rebounds from contact with the cushion at an abnormal angle. In conclusion, side spin is used extensively in snooker, be it intentional or not. A lot of variables impact on the success of the shot, and it takes a lot of time and practise to master the technique. However, when this is achieved, it is a very useful skill to possess to improve difficult situations. So, going back to the original question, does sidespin have an effect on the path of a golf ball during putting? In short, yes! In the example you see here (above), I am hitting a putt from the blue spot, the mid point on the table, 6 feet to the end cushion. I have deliberately created 30rpm of hook spin, swinging the putter from in-to-out (left hand image) and the angle at which the ball rebounds is approximately 20 degrees away from me. In the right-hand image, I have created 30rpm of cut spin (this time cutting across the ball from out-to-in), resulting in the ball rebounding 20 degrees back towards me. Would such a deviation away from a neutral stroke be enough to make an 8-foot putt miss the hole? Potentially, yes. As the two examples highlight here, sidespin is still present on the golf ball over six feet of its journey down the table. That sidespin, however, is present only until TRUE ROLL is achieved. What is the definition of True Roll? To illustrate this, let me start by hitting the cue ball dead centre – i.e. no top spin, no ‘bottom’ spin and no side spin. The ball starts by sliding along the surface. Gradually it will start to rotate because friction slows down the bottom of the ball but not the top. The harder the ball is hit, the further it will go before rotation starts to occur. When it has stopped skidding or spinning then true roll is achieved. True Roll is when the horizontal velocity of the ball equals the angular velocity of the ball. 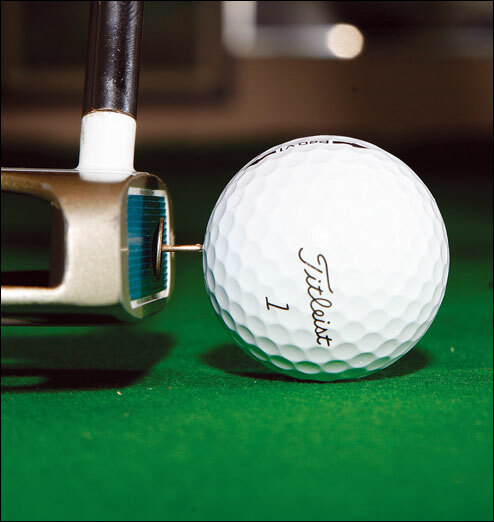 As soon as the golf ball contacts the putting surface, the friction on the ball will cause it to start to over-spin, however this is not PURE over-spin at this point. It can take the best part of four feet out of a 10 foot putt for some tour players to achieve pure roll. However, with optimal launch characteristics, it is possible to achieve true roll within 10-20% of the length of the putt. Cochran and Stobbs (1968) indicate that a putted golf ball will be in a state of pure rolling after travelling approximately 20% of the total length of the putt. However, this is a generalisation and it depends on both the loft of the putter and on the nature of the impact as a golf ball can initially be given top spin or bottom spin. The point of true roll or zero skid. The amount of sidespin imparted on the ball still has an impact until the point of true roll has been achieved. Even 20 rpm (quite a small amount of side spin / rotation) can influence the direction of the golf ball as it lands and makes contact with the green and afterwards. 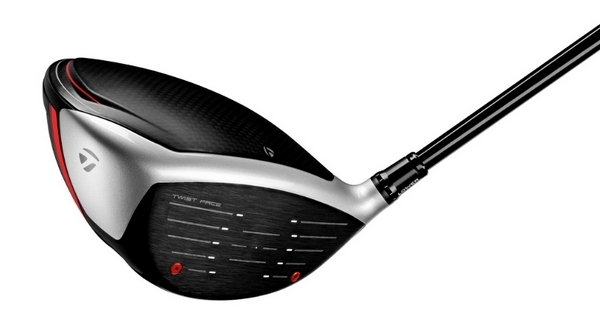 Once you are up to 50-60 rpm it most certainly influences the ball. There is also a degree of rifle spin that is imparted on the golf ball. Using 1000 frames-per-second (fps) video, the effect can be seen upon landing and whilst the ball is still skidding until it reaches true roll. Add in grass texture, slope, grain and these can influence the starting line of a putt with and without side spin. The influence becomes more noticeable the shorter the putt. Many players with a specific hook or cut stroke will be subconsciously accounting for this in their reading of greens. So while sidespin can be useful in snooker it has no place on the putting green. That is why we all strive to achieve a square strike with the putter running through the intended line. Any mismatch between path and face will result in sidespin. In addition, striking the ball out of the toe or heal will create unwanted side-spin. One of my key fundamentals is for the player to create a centre strike: i.e. 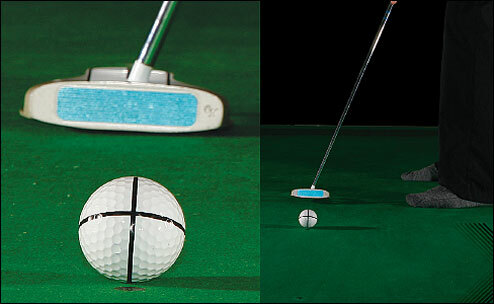 the centre of gravity of the putter head should make contact with the centre of the golf ball. I love this visual: imagine you are trying to tap the drawing pin into the golf ball (above left). Typically, the golfer thinks of a mis-strike as a pull or push through impact, causing the drawing pin to be hit struck with a glancing blow. The same cannot be said for an ascending blow (i.e. a positive rise angle). Many coaches encourage their pupils to actively hit up on the golf ball but any amount of rise angle will also cause a glancing blow for the drawing pin. Creating top spin with a putter is seen as a key ingredient for success, with club manufactures creating face technologies to help create the production of topspin. When relating this to snooker, the topspin shot is typically used when attempting to open a pack of reds. As the name suggests, topspin is produced by striking the upper part of the cue ball (as per image and graphic at right). Just as it is important to make initial contact with the cue ball above the centre, it is also as important to follow-through correctly. A correct strike will cause the ball to spin with forward momentum (in the same direction as its linear motion). The aim of this type of shot is to enable the cue ball to travel further after impacting the object ball due to the extra momentum gained from the forward spinning motion, ultimately increasing the distance the ball travels along the table. This extra distance comes from the acceleration of the cue ball immediately after collision with the object ball. The collision, although reducing the linear velocity of the cue ball, does not affect its angular velocity, and thus the top spin generated at cue contact is converted back into linear velocity by the action of the sliding force (Mathavan, S. et al., 2009). In relation to the degree of topspin imparted on the cue ball, it depends where upon on the ball the cue impacts and with how much force. The higher you strike above the centre line on the cue ball, the greater the topspin produced (Kumar, A., 1999). However, it is important to note that there still has to be precision in the point of contact with the cue ball. Too high and it is easy for the cue to slide over the top of the cue ball, resulting in a miscue, and even slightly too far either side of the vertical plane running through the centre of the ball will result in the production of side spin, adding a further degree of variability to the shot. is travelling, i.e. rotation backwards. Backspin is achieved by striking the cue ball anywhere below the centre line. There are two purposes of putting backspin on a cue ball; to either make the cue ball stop dead after impact with the object ball (not easy to achieve), or make the cue ball travel back the way it came after contact with the object ball (the ‘screw’ shot). This is a technique which allows the player to position the cue ball ready for the next shot. In order to complete this shot successfully, the player must take into account two factors; the distance between the cue ball and the object ball, and the speed of the cue ball. The value of the backspin imparted on the cue ball is at its maximum immediately after cue contact, and dissipates as the ball travels towards the object ball. For the cue ball to travel back the way it came, it must have enough angular momentum from the initial backspin produced to overcome the normal forward momentum. The effect of the rolling frictional force between the cue ball and the table is what provides the force to initiate movement in the opposite direction to the white ball’s initial movement. As with executing other types of spin, although it is important to strike the cue ball low in order to impart backspin on it, the player must be careful not to impact it too low, or the cue ball will jump. Backspin in putting is often the result of too much dynamic loft at the point of impact, if the launch angle is too high (above 2 degrees), the ball will launch into the air (even at 4 mph), high above the grass and bounce as it moves towards the hole. Another variable with potential to cause and affect backspin is the face technology of the putter, a relatively new phenomenon which is now a major marketing angle. A lot of research and development has been invested by the club manufactures looking at reducing backspin at the point of impact. While the ball is skidding or even bouncing as a result of being launched into the air, it has a greater chance of being deflected off line by either the side (hook or cut) spin or imperfections in the green. The ball will eventually get to TRUE ROLL (the same as a seven iron bump and run), but it will take much longer to achieve this. The frictional force between the ball and grass is the key here. Keep the golf ball in contact with the grass at all times for an even declaration of the golf ball. This is required for pace control – after all the majority of three putts are caused by poor pace control, rather than poor green reading. The edge of the table provides a perfect visual key for path alignment. A straight edge or a Putting Mirror can do the same. 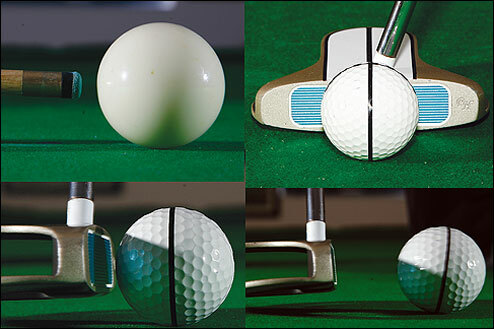 Face or Path – the much more important of the two is putter face angle. The breakdown is that approximately 90% of the ball’s initial direction is determined by the face angle at impact and only approximately 10% is a result of the path the putter is following. The two together determine the horizontal direction of the ball and also if there is any hook or cut spin applied to the ball. Even though path is 10%, I would still be looking for a gentle arc on the backswing and through swing (no loop during transition). The edge of the table provides a great visual. It’s great practice holing putts on the snooker table, running the golf ball (or even snooker ball) along the edge of the cushion. More realistically, I urge you to use a chalk line and hole putts using it as your point of reference, running the blade back and through on a gentle arc. There are no excuses for a miss on the snooker table – no wind, no grain, dead flat surface! During practice, each putt you hit needs a purpose or a consequence. If not you are wasting your time. Factors such as alignment of the putter face, path of the putter, launch angle, speed, impact location, grip pressure, forward or backwards rotation, hook or cut spin, grain, spike marks, slope and even wind can play a significant part. The question I ask the players I coach is simple: do you know the difference between a good putt and a poor putt? Without feedback on the launch conditions of each putt it becomes very difficult to answer this question but without a shadow of a doubt consistency is key. Focus on a square strike with your (fitted) putter along an actual (not perceived) straight target line and you can start to learn when you’ve hit a good one. Mathavan, S., Jackson, M.R. & Parkin, R.M. (2009). Application of high-speed imaging to determine the dynamics of billiards. American Journal of Physics, 77, 788-794. Mathavan, S., Jackson, M.R. & Parkin, R.M. (2010). A theoretical analysis of billiard ball dynamics under cushion impacts. Journal of Mechanical Engineering Science, 224, 1863- 1873. Cochern & Stobbs (1968) Search for the Perfect Swing. Golf Society of Great Britain.